3-BEDROOM CONDO IN CENTRAL CHELSEA! Make this gracious, 3-bedroom 2.5 bathroom condo your new home! This expansive, 1685 square-foot home is an excellent value for the savvy downtown buyer. The formal entry foyer opens to the south-facing living room with elegant and efficient built-ins and the sleek chef's kitchen with professional-grade stainless steel appliances including Subzero refrigerator and Bosch range and Asko dishwasher. Off of the living room is a spacious bedroom with a gorgeous, white marble, ensuite full bathroom, making this an an ideal master bedroom or a private guest suite, pleasantly secluded from the other two bedrooms, which are located at the other end of the home. For those not needing three bedrooms and wanting even more living space this room could also make an excellent den/multi-use room as an extension of the living room. All bedrooms are generous in size with excellent storage, including a bonus extra-large walk-in closet. The two bedrooms at the north end of the apartment share a luxuriously large, spa-inspired bathroom with double sinks, deep soaking tub and separate, glass shower. A powder room is accessed from the hallway as well as your own washer and dryer. Don't miss out on this elegant 3-bedroom condominium with high ceilings, hardwood floors and radiant heat bathroom floors. 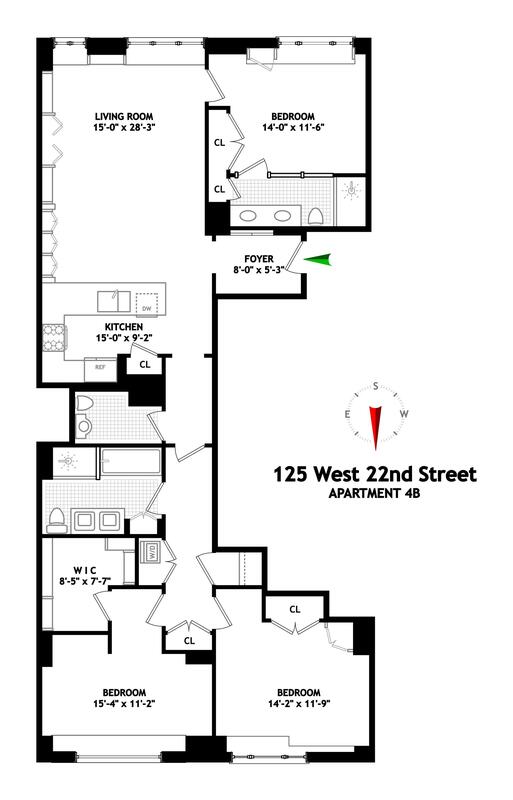 125 West 22nd Street, The Verde Chelsea is a boutique, 33-unit building with a maximum of 3 apartments per floor and boasts a stunning roof deck, landscaped garden, excellent Super and part-time doorman from 7am-11pm. Residents love living in the heart of downtown, just blocks from Madison Square Park, Union Square, the West Chelsea Gallery district and so much more! Pets are welcome!